For printing or saving our general terms and conditions, please click on http://www.ipc-computer.eu on “Conditions of Use (Online-Shop)”. Contractual partner: IPC-Computer Deutschland GmbH, Eisenbahnstr. 20, 77960 Seelbach (managing director: Markus Himmelsbach, Amtsgericht Freiburg i. Br., HRB 705595). IPC Computer specializes in hard- and software products and offers services in this area. Our customer service can be reached Mon, Tue, Thu, Fri from 8:00 to 12:30 and 13:00 to 17:00, Wednesday from 8:00 to 12:30, at +49 (0)7823 96 123-0 or info@ipc-computer.de. Our General terms and conditions apply to private customers (consumer § 13 BGB) and business people (entrepreneur § 14 BGB). In case different conditions to consumer and entrepreneur apply, this will be explicitly indicated. The deliveries, services and offers will only be effected on the basis of our terms and conditions. Telephone advice is given without obligation except in case of intentional or gross negligence. The contract is completed when the confirmation of order (in the form of letter) is accepted by us. The sale contract is also closed when your ordered goods have been delivered. We point out that the pooling of orders, which is automatically generated by email, is no order confirmation. The pooling of orders is merely a summary of your indicated data. Exclusively the content of the order confirmation is important concerning the condition of the article. If the confirmation of the sales contract differs from the order, the confirmation needs to be reconfirmed for closing the contract with legal effect. However, the reconfirmation does not have to be effected in the same manner as the order or confirmation. In case of order before confirmation, the total price of the means of telecommunication, including forwarding expenses and other price components, is indicated. Unless otherwise agreed, we reserve the right to deliver technically improved articles or articles that depart from the order. Our prices are quoted ex works. Packing costs and forwarding charges are debited to the customer. All prices indicated on our Internet site are gross prices incl. VAT, plus freight charges ex stock. Please click http://www.ipc-computer.eu/shipping.php to see the current delivery price list. The prices indicated in the online shop of IPC-Computer Deutschland GmbH apply at the time of receipt of order. In case of a delay in delivery caused by the company, the buyer´s respite is determined by 2 weeks starting at the time when the vendor is receiving the grace period notification. Indemnity requirements due to delay in delivery are excluded unless there is evidence of willful intent or gross negligence on the part of the vendor. In case that it is impossible for us to deliver a certain article, you will receive both a high class and an equivalent high quality article. We reserve the right to changes design or technology that improve the function and quality of an article. Any technical information, data and measurements are subject to the specifications of the manufacturer. This information is no written guarantee; the legal warranty specifications remain unaffected. Unless otherwise agreed, payment is due strictly net upon delivery. In case of the purchaser's refusal, we are entitled to rescind the contract without being obligated to pay compensation to the purchaser. If the purchaser is in default with payment, we are entitled to withhold the consignment until payment is received, even in regard to the performance of any other contracts. Any rights to request any higher damage caused by delay remain reserved. The purchaser shall be entitled to offset payments against counterclaims only when the counterclaim is not disputed or legally established. The right of detention can only be applied when it is based on the same contractual relationship. All products are subject to a two-year warranty period by the date of delivery with exception of consumables and products with a generally accepted short warranty period. If a defect arises and a valid claim is received within the warranty period, IPC Computer will either replace or repair the defective part. When legal requirements are fulfilled, the purchaser has the right of price reduction or to rescind the contract and demand compensation and reimbursement of wasted expenses. An indemnity bond shall remain unaffected. The activated warranty always is a manufacturer warranty. Therefore, warranty claims need to be asserted to the manufacturer. We would like to point out that when the warranty claim of the purchaser is justified, the vendor is obligated to deliver in addition. The vendor is entitled to provide warranty in form of additional delivery or replacement of parts. Several additional deliveries are permitted, if the second supplementary performance fails, the purchaser is entitled to decide whether he accepts a purchase price appropriately reduced or to rescind the contract. This does not apply when the deterioration is due to the examination of the merchandise. IPC Computer is only liable for damages resulting from willfully and grossly negligent breach of duty. The legal representatives or servants are based unless the obtained warranty and respective duties are affected. IPC Computer is not liable for damages to life, body and health not resulting from willfully or grossly negligent breach of duty. Liability according to the Product Liability Law remains unaffected. Liability for defects is excluded if (1) any repair or changing is made by the purchaser or other party without our written agreement, (2) component parts or devices subject to the EMV rule are used with products which are not marked as CE and a defect is caused through this. The purchaser only is responsible for the data saving. This does not apply if IPC Computer, its servants or legal representatives delete the data willfully or grossly negligent. Consumers may return the received goods within 14 days without giving any reasons. The period shall commence upon receipt of the goods and with giving a detailed statement in written form. Only goods being ready for dispatch (e.g. bulky goods) shall be requested to being collected in written form (by email, letter or fax). For meeting the deadline, timely dispatching or requesting collection suffices. In any case the return consignment will be carried out at IPC Computer's risk and expense. When return is effective, the services received from either side as well as usage advantages, if applicable, are to be given back. In case of a degradation or if used (e.g. the amenity and advantage of using), the object cannot or partly not or only in a declined condition be given back, however, a compensation fee will be charged. The compensation fee of the degredated or used object will go beyond the examination of the characteristics and the functionality. "Examination of the characteristics and the functionality " means a testing and a trying of the respective commodity, how it is for instance possible and usual in a retail store. 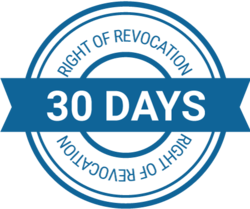 Commitments for the reimbursement of payments must be fulfilled within 30 days. The grace period begins for you with dispatch off of the goods or the redemption demand for us with the receipt. I. The goods have been purchased from IPC Computer. II. Return is only possible within 14 working days from date of invoice. III. A copy of invoice or a truthfully completed return form (see download) is enclosed. -	Articles need to be returned in a covering box provided that it also was sent in a covering box by IPC Computer. -	The original packing of the manufacturer is fully undamaged. V.	Products below 50 EUR plus VAT and articles ordered upon customer request are non-returnable. VI. IPC Computer reserves the right to relate to the current daily price when making a credit note for the returned goods. VII. Goods which were bought under special project terms and goods stored for consignment are also non-returnable. Important: We take the liberty to charge 25 EUR incl. VAT for technical check and restocking. This amount will be deducted from the amount of the credit note. All delivered goods remain the property of IPC Computer until full payment is received or other liabilities of the purchaser towards the vendor are discharged. If the purchaser sells the reserved goods alone or in combination with other goods which do not belong to the vendor, the purchaser assigns the claim amounting to the value of the reservation plus interest. The vendor shall accept the assignment. The value of the reserved goods is due to the invoice amount. The vendor is entitled to claim possession for the reserved goods. Returning the reserved goods shall not be deemed to be a rescission of the sale contract unless rescission of the sale contract is expressly declared. For contractual relationships between IPC Computer and foreign customers, German law applies. For contractual relationships to business people, the place of venue is Lahr. Your indicated data are exclusively used to transact your order. All customer data are stored and processed according to the Federal Data Protection Act (BDSG) and the Tele Services Data Protection Act (TDDSG). Your data are exclusively circulated to service partners that require the data for the order processing. As a matter of course, we will respect the legal requirements and protectable interests during the data processing. Your data will not be shared with any third parties. It is important to note that a data transmission in the Internet cannot be excluded as unauthorized persons may get access to the data submitted during the transmission process. The purchaser agrees that the data (e.g. confirmation of order) also can be transmitted by email. When signing up for the newsletter, your email address will be saved for the purpose of advertisements and market researches.